A sidelining from policy advice and weekly squash games with a noted editor give Godley a commission for a book that will distil the revised approach to the macroeconomy that has taken shape through work on the CEPG’s model and policy reviews. 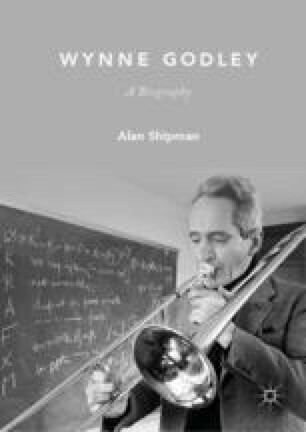 Godley turns to Cripps as co-author, and in 1983 they publish the book which they hope will bring their views to the attention of other economists, challenging the mainstream. The book contains innovations which they believe can show the flaws in the ‘neoclassical’ explanations of economic stabilisation and growth and set out the groundwork for a Keynesian alternative. These include endogenous money creation, mark-up price setting, assessment of the whole system for stock-flow consistency by including balance sheets with income flows and a system of inflation accounting enabling the separation of ‘real’ effects from those of price changes. Despite their hopes of refounding the subject, the book is ignored or misunderstood by most Keynesians and condemned by other economists, its abstraction and technical demands ruling out a wider public audience.